 President John F. Kennedy’s sister Eunice Kennedy Shriver, who carried on the family’s public service tradition by founding the Special Olympics and championing the rights of the mentally disabled, died Tuesday morning, her family said in a statement. She was 88. Shriver had suffered a series of strokes in recent years and died at 2 a.m. at Cape Cod Hospital in Hyannis. The hospital is near the Kennedy family compound, where her sole surviving brother, Sen. Edward Kennedy, has been battling a brain tumor. As celebrity, social worker and activist, Shriver was credited with transforming America’s view of the mentally disabled from institutionalized patients to friends, neighbors and athletes. Her efforts were inspired in part by the struggles of her mentally disabled sister, Rosemary. Peter Collier, author of The Kennedys, an American Drama, called Eunice Shriver the “moral force” of the Kennedy family. Shriver was also the sister of Sen. Robert F. Kennedy, the wife of 1972 vice presidential candidate and former Peace Corps director R. Sargent Shriver, and the mother-in-law of California Gov. Arnold Schwarzenegger. 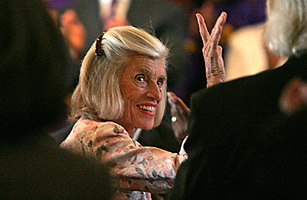 With Eunice Shriver’s death, Jean Kennedy Smith becomes the last surviving Kennedy daughter. When her brother was in the White House, she pressed for efforts to help troubled young people and the mentally disabled. And in 1968, she started what would become the world’s largest athletic competition for mentally disabled children and adults. Now, more than 1 million athletes in more than 160 countries participate in Special Olympics meets each year. “When the full judgment on the Kennedy legacy is made  including JFK’s Peace Corps and Alliance for Progress, Robert Kennedy’s passion for civil rights and Ted Kennedy’s efforts on health care, work place reform and refugees  the changes wrought by Eunice Shriver may well be seen as the most consequential,” Harrison Rainie, author of Growing Up Kennedy, wrote in U.S. News & World Report in 1993. It was Shriver who revealed the condition of her sister Rosemary to the nation during her brother’s presidency. “Early in life Rosemary was different,” she wrote in a 1962 article for the Saturday Evening Post. “She was slower to crawl, slower to walk and speak. … Rosemary was mentally retarded.” Rosemary Kennedy underwent a lobotomy when she was 23, though that wasn’t mentioned in the article. She lived most of her life in an institution in Wisconsin and died in 2005 at age 86.